Make Rush Lake Kennels your pet's home away from home. We are situated on over 50 acres of rural property. 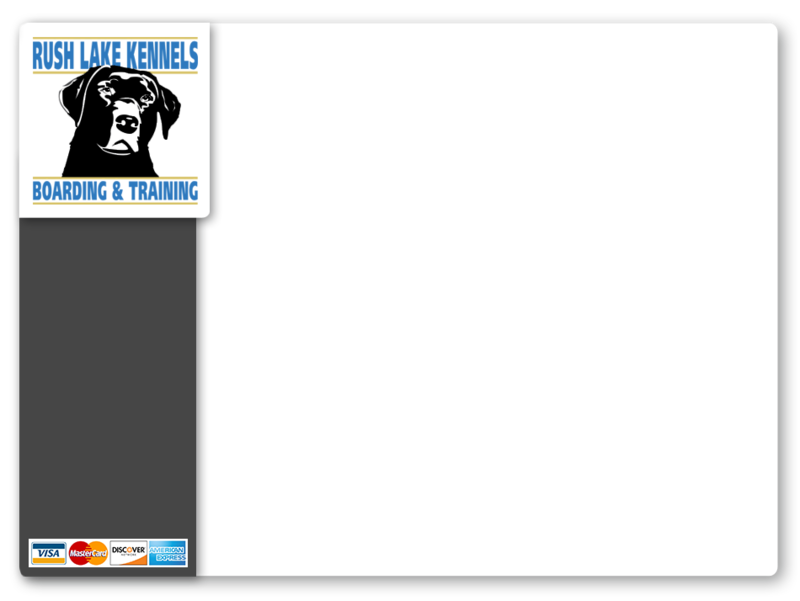 Rush Lake Kennels is licensed and insured and we follow a rigorous daily sanitation routine. We accept all pets regardless of breed, age, and spay/neuter status. Our professional and courteous staff is on site 24 hours a day, 7 days a week ensuring peace of mind for owners. Each guest at Rush Lake Kennels receives unsurpassed personal care and attention. All pets must be current on their vaccinations. Our 1,500 square foot indoor facility is climate controlled to maximize the comfort of your pet. Your dog's stay includes personalized attention, a large indoor run (4’x10’ or 4’8’) with a Kennel Deck, four daily turn-outs in the outdoor exercise area, and premium quality food. Our indoor climate-controlled cat room is separate from the dog boarding and training areas. Each guest will enjoy personalized attention, his own individual condo with a personal lounging platform, and premium quality food. You will be required to agree to and sign our customer contract that outlines our policies, procedures and fees prior to your pet staying with us. We do not make exceptions to our hours, policies or procedures for delayed or cancelled flights. To ensure the well-being of our guests, pets will only be released to their owners for pick-up. A 50% non-refundable deposit is required to book a reservation. The remaining boarding balance and special service fees are due upon drop off. Special services which include, but are not limited to, medication/vitamin administration, food preparation, veterinary care, wound treatment, maintenance grooming, etc. are subject to additional fees.